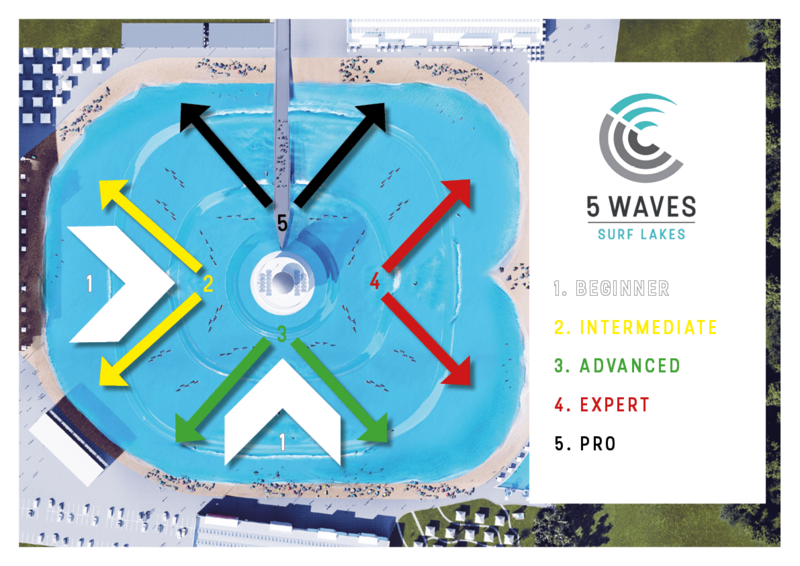 Surf Lakes 5 Wave technology is the worlds first multi-break surf park, where 5 different levels of waves are created simultaneously. This allows for surfers of all levels and abilities to surf. You can have learners at one while running a pro competition at the other, something no other wavepool tech is capable of. For operators, it means maximum options and flexibility for corporate groups, competitions, events and more. The possibilities are endless! Novice / Beginner (White Zone / White Rashie) Can swim but never surfed before. Only allowed on whitewater beginner area and must stay under instruction by surf coaches. Intermediate (Yellow Breaks / Yellow Rashie) Able to demonstrate competence in paddling, prone balance, jump from prone to feet on unbroken wave, ability to on open face of wave, complete basic bottom turn, have basic understanding of water movement knowledge. Allowed in white zone and Intermediate breaks only. Advanced (Green Breaks / Green Rashie) Able to demonstrate high level competence in paddling, jump from prone to feet on unbroken wave with steep face, able to complete bottom to top turns, demonstrate basic tube riding ability and good knowledge of water movement. Allowed in white zone plus yellow and green breaks. Expert (Red Breaks / Red Singlet) Able to demonstrate expert level competence in paddling, jump from prone to feet on unbroken wave with steep face, able to complete bottom to top turns at expert level ie high degree of difficulty close to the breaking part of the wave, demonstrate expert tube riding ability, ability to perform manoeuvres above the wave face (aerial) and demonstrate expert level knowledge of water movement. Allowed in white zone plus yellow, green and red breaks. Pro (Black Breaks / Black Singlet) Have competed in amateur and/or professional surfing competitions and able to demonstrate professional level competence in all aspects of surfing as well as advanced tube riding ability, aerial manovers and demonstrate highest level knowledge of water movement. Access all breaks.